If you are a person who likes to keep up with the fashion, you may always gaze at the new mobile phone release. At the time of the Samsung Galaxy S9, you starve to give away you old iPhone to get a new S9 and for the same reason, or abandon the unloved S7 and pick up a copy of the new favorite iPhone X or iPhone 8 without hesitation. Even some people have both phones at the same time. But here comes up with a problem: How to swap large numbers of contacts between Samsung and iPhone. As we all know, Samsung and iPhone run different operating system like Android and iOS, which makes data transferring a bit of trouble. It is impractical to type the contact phone numbers one by one to your new cell phone manually, which would cost you a lot of time and energy. Well, it is outdated to do an arduous work by yourself. This article introduces three different yet simple ways to help you copy contacts from Samsung to iPhone, or from iPhone to Samsung. 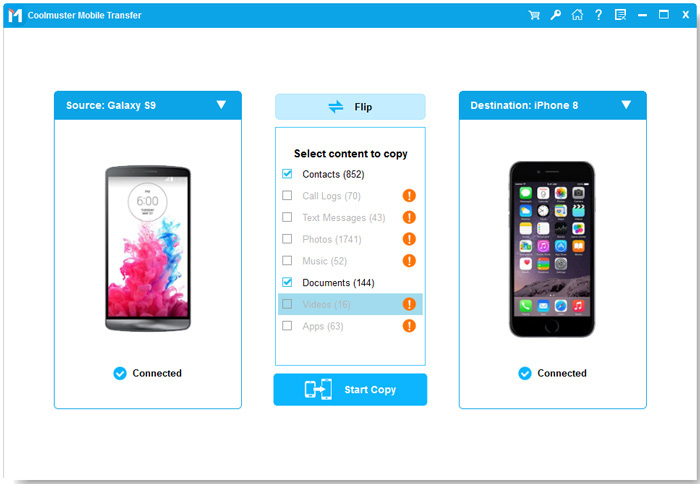 In fact, there is a professional phone contacts transferring program to help you sync massive contacts between your iPhone and Samsung Galaxy fast and efficiently with 3 simple steps, along with several mouse clicks. 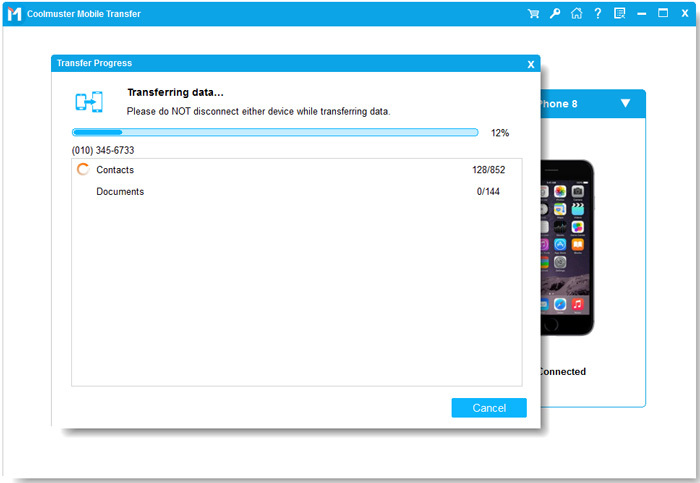 Coolmuster Mobile Transfer or Mobile Transfer for Mac is specially designed for users to copy data between two mobile phones even running with different OS. You can use it to transfer contacts from Samsung mobile phone to iPhone, and also be able to export contacts from iPhone to Samsung. Apart from contacts, it is also able to share SMS, Books, Music, Videos, Photos, etc. between iOS devices and Android phones/tablets. Have you already got the contacts transferring software downloaded and installed on your computer? If so, you can launch it directly and the home window will appear like the following picture shows. Note: Please make sure you have installed iTunes on your computer. Using USB cables to connect your Samsung Galaxy phone and iPhone to your computer. After the transfer program detects your phones successfully, both the phones will be displayed on the window, named as "Source" and "Destination". You can change their positions by clicking the "Flip" button in the middle of the two phones. Note: Phone Transfer is compatible with iPhone X/8 Plus/8/7 Plus/7/6S/6/5S/5/SE and Samsung Galaxy S9/S8/7/6/5/S4/S3/S2. You can start transferring phone contacts right now. To sync the contacts from one phone to another, please mark the box in front of "Contacts", then click the button "Start Copy". Make sure both of phones are connected to the computer during the contacts transferring process. When the transfer finishes, you can click "OK" button. Note: You can simply click the "Cancel" button whenever you want to cancel the contacts transfer process. If you have a Google account, you can use Google Contacts Service to transfer contacts from your Samsung phone to your iPhone. The following are specific operating instructions. Step 1. Turn on your Samsung phone and go to choose Settings > Accounts. Sign up with your Gmail account info. Step 2. Turn on the option of "Sync Contacts" to sync all your contacts on this Samsung phone to the cloud service. Step 3. Go your open your iPhone and choose Settings > Mail, Contacts, Calendars > Add Account. Then, you can enter your Google account info and start to sync contacts from Samsung to iPhone. In addition, you can also import contacts from your Samsung phone to your iPhone by swapping the SIM card. But you need to meet two requirements: First, make sure that the SIM cards on Samsung and iPhone have the same size. We don't recommend changing the size of the SIM card by trimming, as doing so may damage the SIM card and cause your contacts permanently disappear; Secondly, make sure all contacts are saved on the SIM card, because some contacts may be stored in the phone's memory instead of the SIM card. Steps: If you can make sure that both of the above requirements are met. Then, you can take the SIM card out of your Samsung phone and plug it into the iPhone. Now go to "Settings > Mail, Contacts, Calendars > Import SIM Contacts" on your iPhone to sync contacts from your Samsung phone to your iPhone.